Sen. Bernie Sanders (I-Vt.) can be forgiven for missing a vote late Monday on Gayle Smith's nomination to head the U.S. Agency for International Development. Earlier that afternoon, the 74-year-old senator underwent elective hernia surgery at a Washington, D.C., hospital. By 9 a.m. the next day, according to spokesman Michael Briggs, he arrived at the Dirksen Senate Office Building and got back to work. During his nine years in the U.S. Senate, Sanders has missed 90 of the 2,806 roll call votes he's been asked to cast, or about 3.2 percent, according to an analysis by GovTrack.us. That's a bit more than the median 1.6 percent lifetime absentee rate of all senators currently serving. As he juggles his presidential campaign and his day job as a U.S. senator, Sanders' missed vote tally has been steadily growing. Nearly half of his missed votes, 41, have come in the past year, pushing his absentee rate up to 11 percent since last December. In the past two months, that rate has crept up to 18.4 percent. Among the seven votes he missed in October and November were several nomination confirmations, as well as procedural votes on bills to fund the Department of Defense and the Department of Veterans Affairs. Until early this year, Sanders chaired the Senate Committee on Veterans' Affairs. Both votes were held on November 5, as Sanders appeared at the New Hampshire Secretary of State's Office in Concord to file for the first-in-the-nation primary. Shortly after launching his presidential bid in May, the Vermont independent foreshadowed the likelihood that he would miss work as his campaign ramped up. "When you're running for president of the United States and you have to be in 50 places at the same time, it is possible that I will miss votes," he told USA Today at the time. "I understand my obligation to the people of the State of Vermont and I understand my obligation to be here to cast the important votes ... I'll just simply do my best, and up to this point we've done pretty well." Compared to other senators seeking the presidency, Sanders is still doing relatively well. In the past year, Sen. Marco Rubio (R-Fla.) has missed nearly three times as many votes as his Vermont colleague, or 32 percent. Sen. Lindsey Graham (R-S.C.) has missed 25 percent and Sen. Ted Cruz (R-Texas) has missed 24 percent. Only Sen. Rand Paul (R-Ky.) has missed fewer votes than Sanders: 5 percent. Rubio has been heavily criticized by his Republican rivals and a home-state newspaper for missing so many votes. 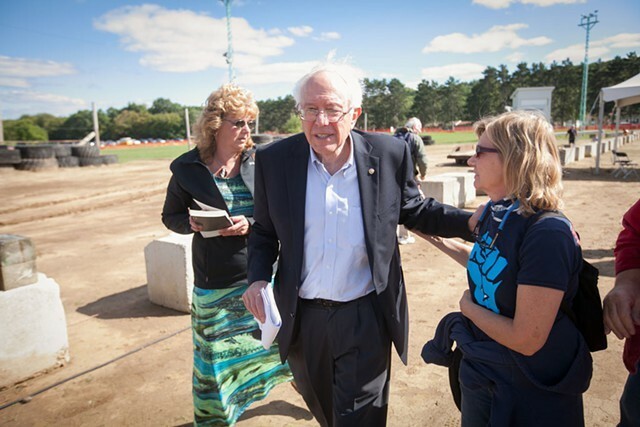 Of the three leading candidates for the Democratic nomination, Sanders is the only one simultaneously holding down a day job. Martin O'Malley's second term as governor of Maryland ended early this year, while Hillary Clinton wrapped up her tenure as secretary of state in February 2013. But a comparison of sorts is possible. GovTrack computed historical absentee rates for those who ran for president in 2008. At a roughly equivalent point in that election cycle, then-senator Clinton had missed 18 percent of the votes held in the prior year — a greater number than Sanders' current 11 percent — while then-senator Barack Obama had missed 33 percent. Sen. John McCain (R-Ariz.), who would go on to win the Republican nomination, had missed a whopping 54 percent of the prior year's votes. Briggs defended his boss in a written statement Wednesday, saying, "Bernie takes his Senate duties seriously and is proud to represent Vermont." The spokesman continued: "That’s why, just this week, he helped craft a highway bill nearing final approval that will bring $1.1 billion to Vermont over the next five years. That’s why he was on the Senate floor on Tuesday leading the fight against a Republican budget that would throw 17 million people — including thousands of Vermonters — off their health insurance. That’s why he led the fight in the Senate against Republican efforts to defund Planned Parenthood, which provides health care for thousands of Vermonters and 3 million people a year nationwide. That’s why he has worked with Sen. [Patrick] Leahy and Rep. [Peter] Welch to bring home heating assistance to Vermont families. That’s why he helped secure a $2.7 million grant in September as part of dramatically increased support for community health centers that provide primary care, dental care and low-cost prescription drugs for more than one in four Vermonters. That’s why he has fought Postal Service cuts and is leading the effort to restore overnight mail deliveries that seniors and veterans in rural areas rely on for delivery of their medicine." Sanders' lifetime absentee rate isn't too far from those of his two fellow congressional delegates from Vermont. Welch, a Democrat, has missed 153 of the 6,991 roll call votes held since he joined the U.S. House in 2007, according to GovTrack. That's 2.2 percent — precisely the median lifetime rate of all House members currently serving. Leahy, also a Democrat, has missed 577 of 15,562 roll call votes since he joined the Senate in 1975. That's an absentee rate of 3.7 percent. Only five senators in U.S. history have cast more votes than Leahy.